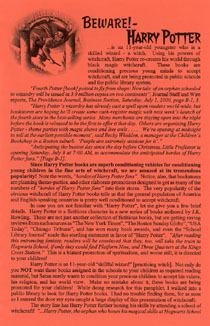 Harry Potter is taking the world by storm, and children as well as adults are being caught in a very dangerous snare! Harry Potter teaches that white magic is good because it can be used to "help" people. But is there really a "good" magic? Is this just another "innocent" fictional story, or are millions of people being led down a very dark path?! Find out in this brochure! First copy FREE, additional copies $.05 each + S/H.